High Court of Karnataka has recently announced direct recruitment notification for 71 Civil Judge Vacancy. Applicants who are willing to apply for Karnataka High Court Recruitment 2018-19 can fill the online form before the last date. The online Registration form appears on official site from 12.12.2018. Applicants are invited to fill online form for High Court of Karnataka Civil Judge Jobs. You can apply via online mode for Karnataka High Court Jobs before on 11.01.2019. Karnataka High Court is inviting online application for direct recruitment of 71 Civil Judge Vacancy. Interested candidates should check that they fulfill or not eligibility criteria. Applicants are advised that they should read full given below article. 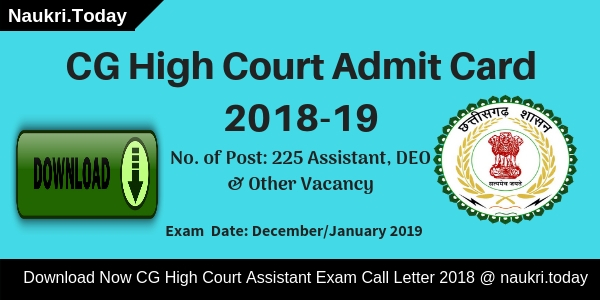 Here our team published High Court of Karnataka Vacancy 2018-19 details. You should read Karnataka High Court Jobs given below eligibility criteria, application fees, selection process, pay scale, and other details. What Is The Eligibility Criteria For Karnataka High Court Recruitment 2018-19 | High Court of Karnataka Civil Judge Jobs? How I Fill Online application for Karnataka High Court Recruitment 2017/ HC Karnataka Jobs ? Desired participants should examine that they are eligible or not. Applicants should check High Court Karnataka Vacancy eligibility criteria. It comprises details of education qualification, age limits and other details. Before apply candidates must read given below eligibility details of Karnataka HC Vacancy. Applicants who are going to apply for High Court of Karnataka Jobs must check own education qualification. Candidate must have Degree in Law granted by a University established by Law of India. Participants also enrolled as an advocate for Karnataka High Court Vacancy 2018-19. General and other unreserved category candidates maximum age is required 35 Years. Karnataka High Court Recruitment maximum age limit for SC candidates is 38 Years. Upper age limit relaxation is applicable for Ex-Serviceman candidates is 03 years. 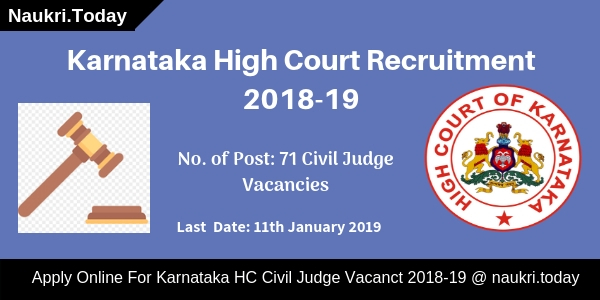 For more details, the application should check High Court of Karnataka Civil Judge Job Notification 2018-19. Participants selection will be made on the basis of written examination, viva voice & Computer test. First the department conducted High Court of Karnataka Recruitment Preliminary Examination. Qualified applicants can attend Karnataka High Court Civil judge Job Main Examination. Main exam qualifiers will call for viva voce & computer test. Final Selection of Karnataka HC Job is made on the basis of the main exam and viva voce. Furthermore, you should check given below High Court of Karnataka Vacancy Notification 2018-19. After selection of the participants, they will get a monthly Salary. Applicants will receive Rs. 27700 – 770 – 33090 – 920 – 40450 – 1080 – 44770/- Per Month. For more inquiry you should read Karnataka High Court Notification. Candidates who are belonging to General Category and Category IIA/IIB/IIIA/IIIB need to pay Rs. 500/-. SC/ST/Category-I candidates have to pay Rs. 250/- for Karnataka HC Civil Judge vacancy. Applicants can submit Karnataka High Court Civil Judge Job fees through online or offline mode. Participants who want to desire to submit application fees through online mode may use SBI Online Payment Gateway. Other application should submit their challan in any SBI Branch. Interested and eligible candidates who are going to apply must fill the online application form. Online application form available on here or official site. Participants should follow some given below steps for filling up Karnataka High Court Job Online Form. First, all applicants advise going official site www.karnatakajudiciary.kar.nic.in. Go Notification section and then go recruitments. Read High Court of Karnataka Civil Judge Recruitment Notification. Then Click on Apply Online Application for Karnataka High Court Civil Judge Job. Read General Instruction and click on Apply button. Fill Personal, Contact, Enrolment details for Karnataka HC Recruitment. Upload Passport Size Photograph, and Signature in JPG format. Submit the application form and then make payment through online or offline mode. Take the hard copy of Karnataka High Court Recruitment for future uses. You can also apply through direct to click on mention below link. Conclusion Karnataka High Court Recruitment 2018-19: High Court of Karnataka has issued notification for 71 Civil Judge Vacancies. Interested candidates who are eligible also may apply through online mode from 12.12.2018. Online application form is available here and official site. Karnataka High Court Civil Judge Recruitment application form available till 11.01.2019. Dear Applicants, If you are searching Karnataka High Court Notification 2018, then you visit a right place. High Court of Karnataka has released advertisement for employment of 834 Oath Commissioners Vacancy. Interested and eligible candidates can apply for Karnataka High Court Recruitment 2018 from 13.07.2018. Applicants can fill online application form either official site or also here. The last date of apply online for Karnataka HC Vacancy is 31.07.2018. Rest of details you need to read given below article carefully. Karnataka High Court application is inviting for Advocates who want to become Oath Commissioner. The online registration of Karnataka High Court Oath Commissioner Vacancy is already available on official site. Applicants also fill their application form from here. The direct link to apply High Court of Karnataka Jobs 2018 is mention at the end of the article. Advocates who are not more than 35 years are eligible to apply for Karnataka HC Recruitment 2018. Furthermore, information like eligibility criteria, pay scale and others are mention on below segment. Candidates who want to apply for Karnataka high Court Vacancy must check that they are eligible or not. Applicants must fulfill eligibility criteria if they are going to fill application form. Here in below section, we mention some of eligibility conditions of HC Karnataka High Court Recruitment 2018. Before going to fill high Court of Karnataka Recruitment online form all applicants should check qualification details. As on 13.07.2018 advocates, those have practice equal or above 02 years and not more than 04 years are eligible for Karnataka HC Jobs 2018. Furthermore information you can also check given below official notification. Participants who are not more than 35 years as on last date are eligible for Karnataka High Court Recruitment 2018. Age relaxation details check official advertisement. As per applicants education qualification and experience candidates selection merit list will prepare. Eligible Candidates those are submitted online application form merit list will prepare. List of eligible candidates for appointment will be published on official site. They will be called for interview. Final selection will be made as per the personal interview. For more details check Karnataka High Court Recruitment Notification 2018. If you are selected for Karnataka HC Jobs then you will also get an attractive salary. Applicants salary criteria is decided by the department. Rest details refer to official notification. Candidates may fill High Court of Karnataka Jobs online form on official site as well as here. Before going to fill online application form applicants must have valid email id and mobile no. Participants also have scan copy of photograph and signature. After that, you can follow some given below instructions to fill Karnataka High Court Recruitment online form. First of all, candidates go to official site karnatakajudiciary.kar.nic.in. Go to Notification segment and then click on recruitment. Now Download Karnataka HC Oath Commissioner Recruitment Notification. Read it properly to check your eligibility. Now Click on Apply Online for Karnataka High Court Jobs 2018. Now enter your personal, educational and other information on your HC Karnataka Online Form. upload Signature and photograph & other documents. Now submit Karnataka High Court Recruitment Application Form. Applicants must attach original testimonials with your Karnataka HC Recruitment Online Form. Candidates also carry self-attested three sets of photocopies at the time of verification. List of documents to be carried for verification of Karnataka High Court Oath Commissioner Jobs is as under. High Court of Karnataka has released a recruitment notification of 76 Assistant Court Secretary & Typists Vacancy. Candidates who are interested in Karnataka High Court Recruitment 2017 can fill online application from here before the closing date. Online registration for Karnataka HC Recruitment has been started from 30.03.2017. Closing date for submit application form is 30.04.2017. Karnataka High Court is inviting online application for recruiting candidates on 76 Various Vacancy. this is great chance to fill online application for those candidates who are waiting for Karnataka HC Vacancy 2017. applicants are advise to check eligibility Criteria before applying online application form. For more details about Karnataka High Court Vacancy you can check given below details. For Assistant Court Secretary Jobs : Applicants must have passed SSLC Exam/ Diploma in Commercial Practice/ Secretarial Practice in English/ Senior Grade Examination English Shorthand or equivalent qualification from recognized University/ Institute for this vacancy. For Typist Vacancy : Applicants must have done Degree in Any stream with minimum 55% Marks (50% of SC/ST Category) & passed Senior Grade Typewriting Examination in English & Kannada for Karnataka High Court Typist Recruitment 2017. High Court Of Karnataka Recruitment 2017 Age Limit : Minimum age of the candidates for Karnataka High Court Recruitment should be 18 years & Upper age must be 35 years. age relaxation is applicable up to 05 years for SC/ST category candidates & 03 years for Category 2A,2B, 3A, 3B For Karnataka HC Typist Jobs 2017. Application Fee For Karnataka HC Recruitment 2017 : Candidates who are belonging from General/BC Category need to pay Rs. 250/- for filling High Court Karnataka job online form. Other than these category like SC/ST Candidates must be paid Rs. 100/- for applying online application for Karnataka High court Asst Court Secretary vacancy. Asst Court Secretary jobs : Rs. 20000 – 500 – 21000 – 600 – 24600 – 700 – 28800 – 800 – 33600 – 900 – 36300/- will paid for Karnataka High Court Court Secretary Vacancy 2017. Typist Jobs : Candidates will paid pay band Rs. Rs. 11600 – 200 – 12000 – 250 – 13000 – 300 – 14200 – 350 – 15600 – 400 – 17200 – 450 – 19000 – 500 – 21000/- for High Court Karnataka Typist Jobs. Selection Method For High Court Karnataka Assistant Court Secretary jobs : Selection of the candidates for Karnataka High court Recruitment 2017 will based on Shorthand & Typing Test and Viva Voce. For more details about Exam procedure you can check given below details. Final selection will based on merit list. which will be made on the basis of Marks Obtain in Exam & Viva Voce. For more details about Karnataka high Court Recruitment you can check from here. Keep in touch with this page for more Updates. First of all candidates log on to the official website www.karnatakajudiciary.kar.nic.in. Now click on Official Notification of Karnataka High Court Jobs 2017. Upload your Recent photo & signature in form properly. Now deposit application fee through online or offline mode. Conclusion: Karnataka High Court Recruitment 2017 for 76 Assistant Court Secretary & Typist vacancy. Candidates can apply online application for Karnataka HC Recruitment on or before the last date 30.04.2017.